Trigeminal nerve block provides hemifacial anesthesia and is used predominantly in the diagnosis and treatment of neuralgia. It is a relatively underused procedure, mainly owing to the difficulty of achieving a reliable block. Before proceeding with the block, one should have a precise knowledge of the anatomy, should be thoroughly familiar with the details of the procedure, and should be fully aware of the potential complications. Trigeminal neuralgia is characterized by spontaneous, paroxysmal lancinating pain in the trigeminal nerve distribution. Often, the cause is not known. Occasionally, tumor infiltration, vascular compression of the nerve, or diseases such as multiple sclerosis may be the causative factors. Therefore, these patients should undergo complete neurologic evaluation. Before neurolysis is carried out, the patient’s response to a diagnostic block with local anesthetic must be assessed. 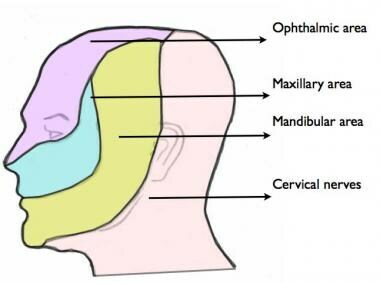 The trigeminal nerve is the fifth cranial nerve and supplies sensory innervations to the face via its branches (see the image below). The trigeminal nerve ganglion (also referred to as the gasserian ganglion) lies in the trigeminal cave (also known as the Meckel cave), which is a dural invagination in the petrous part of the temporal bone. This ganglion is formed by 2 roots that exit the ventral surface of the brainstem at the midpontine level and travel forwards and laterally to enter the trigeminal cave. 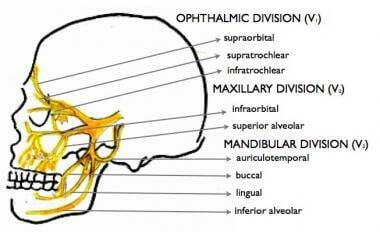 The trigeminal ganglion is bounded medially by the cavernous sinus, superiorly by the inferior surface of the temporal lobe, posteriorly by the brainstem, and anteriorly by its exiting 3 branches (ophthalmic, maxillary, and mandibular; see the image below). The dural pouch (trigeminal cistern) contains cerebrospinal fluid (CSF) and lies behind the ganglion. The postganglionic fibers are the sensory nerves to the face and exit via various foramina at the base of the skull. The ophthalmic and maxillary nerves are purely sensory. The mandibular nerve has sensory and motor functions. For more information about the relevant anatomy, see Trigeminal Nerve Anatomy. The success of a trigeminal nerve block depends on proper identification of the anatomic landmarks and the nerve itself. The duration of the block depends on the agent used. Local anesthetics typically provide analgesia lasting up to 12 hours, whereas neurolytic agents such as glycerol or alcohol have effects lasting for up to 6 months. Radiofrequency ablation has a 98% success rate and yields a longer pain-free period. Treatment with glycerol has a success rate of 70-90% and a recurrence rate of 54% at 4-year follow-up. In a study of 79 patients who underwent either percutaneous anhydrous glycerol rhizolysis (PRGR) or radiofrequency (RF) thermocoagulation, 23 (58.9%) of the 40 PRGR patients and 33 (84.6%) of the 39 RF patients experienced excellent pain relief. The mean duration of excellent pain relief in the 2 groups was comparable. By the end of the study period, 39.1% of the PRGR patients and 51.5% of the RF patients had experienced recurrence of pain. Greenberg C, Papper EM. The indications for gasserian ganglion block for trigeminal neuralgia. Anesthesiology. 1969 Dec. 31(6):566-73. [Medline]. Peters G, Nurmikko TJ. Peripheral and gasserian ganglion-level procedures for the treatment of trigeminal neuralgia. Clin J Pain. 2002 Jan-Feb. 18(1):28-34. [Medline]. Scrivani SJ, Mathews ES, Maciewicz RJ. Trigeminal neuralgia. Oral Surg Oral Med Oral Pathol Oral Radiol Endod. 2005 Nov. 100(5):527-38. [Medline]. Tenser RB. Trigeminal neuralgia: mechanisms of treatment. Neurology. 1998 Jul. 51(1):17-9. [Medline]. Udupi BP, Chouhan RS, Dash HH, Bithal PK, Prabhakar H. Comparative evaluation of percutaneous retrogasserian glycerol rhizolysis and radiofrequency thermocoagulation techniques in the management of trigeminal neuralgia. Neurosurgery. 2012 Feb. 70(2):407-12; discussion 412-3. [Medline]. Nader A, Kendall MC, De Oliveria GS, Chen JQ, Vanderby B, Rosenow JM, et al. Ultrasound-guided trigeminal nerve block via the pterygopalatine fossa: an effective treatment for trigeminal neuralgia and atypical facial pain. Pain Physician. 2013 Sep-Oct. 16 (5):E537-45. [Medline].